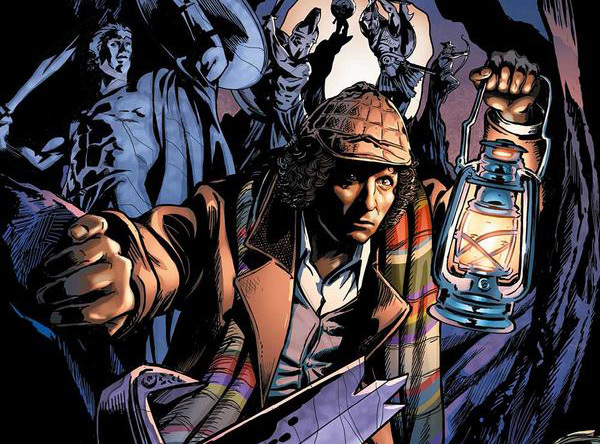 Doctor Who: THE FOURTH DOCTOR #5 Review @comicstitan | Warped Factor - Words in the Key of Geek. Tony’s in the lap of the gods. The Fourth Doctor mini-series from Titan Comics has been a splendid invocation of mid-seventies Tom Baker madness and mayhem, with precisely placed gibber, a gloriously timely ‘Ahhhhh…’ or two and just a soupcon of snarling Fourth Doctor rage to spice things up. In essence, it’s been close to perfect, while in some senses ‘printing the legend’ of the Fourth Doctor for anyone less than intimately familiar with his time in the Tardis, providing a great jumping-on point for Fourth Doctor adventures in two dimensions. Issue #5 is well-placed to finish off the tale of the Medusa, opening with the Doctor and Miss Athena James having been summarily transported to an audience with Zeus. Y’know…as ya do. Athena’s father and Sarah-Jane are rather less lucky in this story, but the pace of this final issue ensures it covers the ground reasonably fast – the Medusa finds a way out of its centuries of imprisonment, which we should have seen coming but, to the credit of writers Gordon Rennie and Emma Beeby, didn’t. The Doctor chats to the father of the gods, and there’s more than a touch of The Stones of Blood about the whole thing – intergalactic villainy, corrupted creatures serving the criminal, the forces of justice missing a boat or two, and inspiring not so much a legend as an entire pantheistic religion and some great myths. The Doctor also gets to deliver a solid speech or two – one to Zeus, that allows for the transfer of responsibility for the Medusa to the Time Lord, and sets a great big ticking clock in motion to drive the pace, and another to the Medusa itself, an almost Tenth Doctor ‘One chance’ speech, which Rennie and Beeby expose from the Medusa’s point of view as being really quite patronising. It’s both solidly seventies and freshly 21st century at one and the same time, establishing the Fourth Doctor firmly in the line of incarnations that lead up to the New Who Doctors with which a younger audience will be more familiar. You can call that a cynical marketing ploy to sell comic-books if you like, but at least while selling them it delivers a cracking, creepy story with plenty of high points and cliff-hangers, and a coherent and very believable Fourth Doctor with whom we can have new adventures in the 21st century, so if you’re looking for the bad, you’re pretty far out of luck. There’s also a delicious postscript to this story which was seeded a few issues back. The fact that Miss James is engaged to a Navy surgeon might be considered a spoiler by some, but when the ‘reveal,’ such as it is, arrives, the reactions of both the Doctor and Sarah-Jane are very much in keeping with their TV versions, sweetening the whole thing just enough to make it work. If, as seems to have been the case with the Ninth Doctor, the mini-series acts as a tester for whether a full, permanent series would have the legs to command sales, let’s say this – there’s been practically no point at which the Fourth Doctor mini-series has put a foot wrong. The Doctor and Sarah-Jane have been both believable and recognisable, the mystery intriguing, the solution relatively sensible, and the atmosphere solidly creepy. 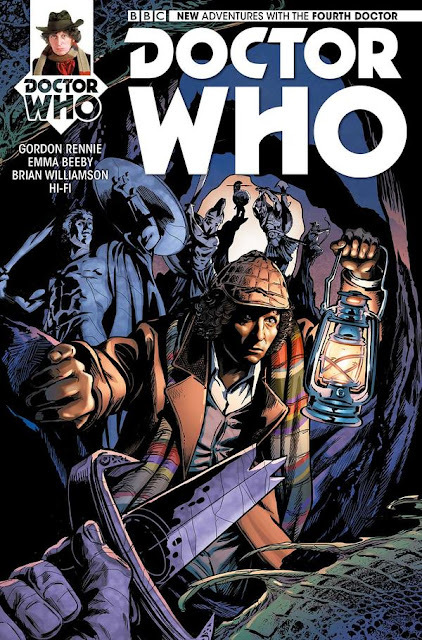 The artwork from Brian Williamson has always rendered these much beloved characters in vivid, recognisable ways (compare with Supremacy of the Cybermen and see how important that is), and Hi-Fi on colourwork has tirelessly heightened the atmosphere of Victorian London and dark spooky caves of doom. The whole thing has been delivered with both a sense of gothic joy and a note of distinct awareness of the fan-love for this period in Who history. If you put us up against a wall and made us choose between the five issues of the Fourth Doctor mini-series and (at the time of writing) the single existing issue of the Third Doctor mini-series…we might writhe and grunt and grit our teeth and finally screen ‘No, not the Mind Probe!’ rather than explicitly admit we’d have to go with Captain Velvet. But nobody’s going to do that – if Doctors Nine, Ten, Eleven and Twelve can happily co-exist in the comic-book universe (any news yet of a full Eighth Doctor series, Titan? That mini-series was epic too), there’s no reason to think Doctors Three and Four (and Five and Six for that matter), couldn’t each serve enough of an audience to warrant their existence in longer-form adventures. So we’re refusing to play the Favourites game, and simply revelling in the joy that has been the Fourth Doctor mini-series, the legend-printing, deerstalker-wearing, god-confronting, quantum-locking, scary-statue’d joyfest of having the Fourth Doctor and Sarah-Jane together again on the page, their essences rendered for us in both words and pictures with both a period conviction and a breath of fresh, 21st century air. Go get issue #5 today, and join the Grecian revels as they come to an end – at least for now.